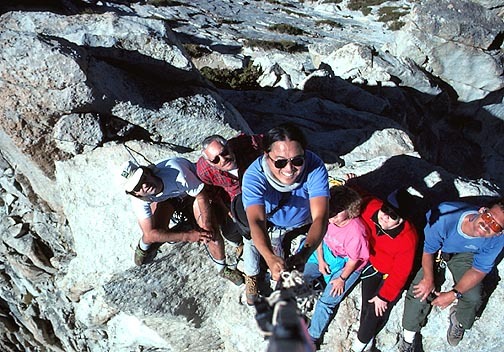 After years of non-official leading, essentially barred by the local chapter, I had become a charter member of the new, California Mountaineering Club, which was formed in 1990. Largely made up, initially, of Sierra Peaks Section members, it was to offer an alternative to the Sierra Club actions against mountaineering outings in the mid to late 1980's. I had waited to see what the leadership standards of this club were. In 1993, I chose to offer a weekend lead of these two semi-technical climbs. I was so familiar with them. I had led Cathedral Peak some four times before, as leads for the local chapter, and privately. I had done Unicorn once before, and assumed that it was not a big problem. Making my drive south along U.S. 395, I snapped my usual photos. I did a short hike up from the Tioga Pass Highway, checking some trails for exercise. I scheduled a meeting time and place in Lee Vining, CA, the morning of the climb. Collecting the participants together, we drove up Highway 120 to the Cathedral Lakes trailhead near Tuolumne Meadows. Some six of us were ready to go by about 8 a.m. The weather was still beautiful. Plenty of tourists jammed the Meadows. We hiked up the use trail to almost Budd Lake, then I took the group cross-country up toward the peak. This is a somewhat steep, sandy, rocky approach, through scrubby pines. This route offers a good look at the Southeast Buttress route (5.4), which is a climbing classic. We reached the ridge to the northeast of the summit pinnacles. Circling toward the peak ridge, we climbed the class three rocks and slabs to the point of rope-up. I quickly led the class 4 section, then saw that the register was gone. Using two chocks and the bolted lower plate of the old, metal register box, I anchored in, and belayed the others to the top. With room for all six of us, I had hauled up my photography equipment for this unique shot from above our summit perch. I tied together a Ramer telescoping ski pole with my camera tripod, making for an effective 10' long tripod. At the end of this was my camera, to be pointed downward back at us. I hoped that this would make a great action photo, but the lighting didn't favor me. While the technical aspect was fine, the composition, being unviewable, wasn't as effective. I get somewhat queasy while staying on this airy summit block. I belayed the others down, and downclimbed myself with help from the others. We rapidly returned to the cars, and made arrangements to meet for Unicorn Peak the next day. Driving back to Lee Vining, I had dinner there. I car camped along 120 in the Mono County campground, which is one of the cheapest stays about. The next morning, I drove back up to Tuolumne Meadows to meet four of the others. Driving through the main campground, we parked at the trailhead for Elizabeth Lake. We had a leisurely start, passing by Elizabeth Lake, and were, in a couple hours, at the beginning of the class 3 section preceding the class 4 summit. 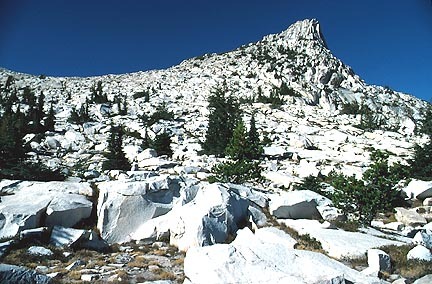 The others made the highly exposed moves to the only difficulties of Unicorn Peak. I did snap a photo of the view to Cathedral Peak. I had been too busy leading to do much photography. One of the other participants kindly led the way, up a high, rocky mantleshelf, which avoids the exposure. He belayed the rest of us. I took the ledge on the left, which involves some weak gymnastics. This doesn't easily allow for a pack or camera case to be worn while doing the moves. We all signed in the register, and then reversed course and climbed back down. Back to the cars by 2:05 p.m., the others all had a long drive home. I stopped at Olmsted Point for a couple telephoto shots. Each of these peaks is a moderate day climb, with some, roughly, 2,200 feet of gain over 8-10 miles round trip. The confidence I regained from this successful, safely done, lead inspired me to do several peak leads the next year, for the CMC.